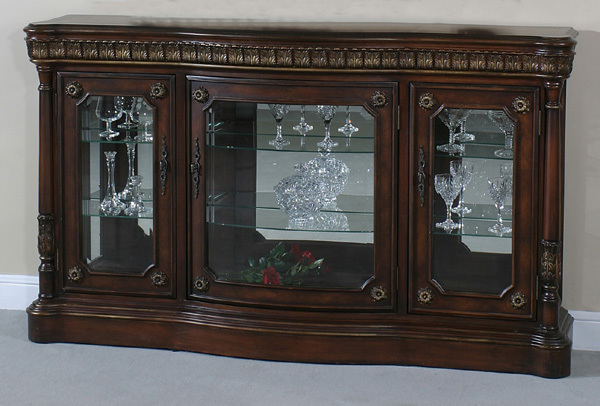 The beautiful Classica Curio Console Buffet is one outstanding curio. Your most treasured possessions will be safe and secure in this curio. A splendid mirror back with glass shelves reflect so beautifully with the three halogen step lights. The Impressive leaf and rosette carvings make this a knock-out, and just wait and see what it will do for your home! Top - 69" x 15"
Fixed Shelf Area on Sides - 17.5" x 9" x 10"
Fixed Shelf Middle - 28.5" x 9" x 10"